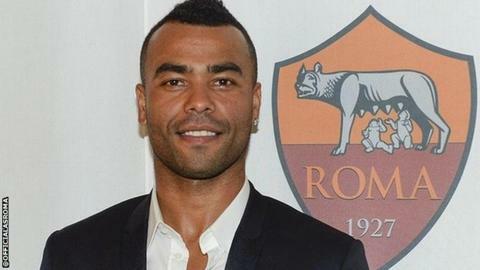 Former Chelsea defender Ashley Cole has joined Roma on a two-year deal. The Italian Serie A club tweeted a photograph of the 33-year-old, and confirmed on their website he has signed a contract until 2016. Former England left-back Cole was a free agent after Chelsea opted not to offer him a new deal at the end of the season, his eighth at the club. He tweeted: "Will never forget my time in England - was a pleasure, but now onto a new challenge." Cole joined Chelsea in 2006, winning the Premier League in 2010 and the Champions League in 2012. He also won four FA Cups with the Blues to add to the three he lifted with Arsenal, where he was a Premier League champion twice. Cole, who started 15 Premier League games last season, won 107 caps for England but announced his retirement from international football after being left out of squad for the 2014 World Cup. Roma will compete in the Champions League this season after finishing as runners-up in Serie A last term.